IFA 2018: Toshiba reveals 8K, full array, voice-controlled and ‘wall art’ TVs | What Hi-Fi? Having talked about everything from 4K HDR OLEDs to Alexa-enabled TVs and a Star Wars-themed set at IFA 2017, Toshiba was always going to have a hard task one-upping itself on the European stage this time round. But fortunately we’re not left short-changed. Among Toshiba’s many announcements today are an 8K TV concept; a 65in 4K HDR Full Array LED model; an Android TV with built-in Google Assistant; bezel-less and ‘wall art’ models; and an, ahem, interestingly-named ‘High Bright Wide Colour Gamut’ TV range. The 8K TV is Toshiba’s first stab at the higher resolution, which will no doubt enjoy quite the presence at IFA 2018. The 65in model couples its 7680 x 4320 resolution with an 8K upscaler and support for the HDMI 2.1 spec necessary to passthrough 8K (and 10K) content with HDR. On that note, the TV plays ball with HDR10, Dolby Vision and Hybrid Log Gamma content, and supports Wide Colour Gamut (Toshiba claims it can reproduce 1024 shades per colour, showing 99% of the DCI-P3 colour space). Next up on Toshiba’s TV conveyor belt of announcements is a 65in 4K HDR LED TV with full array (as opposed to edge-lit) LED backlighting. 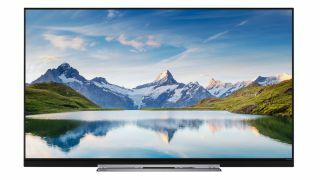 As the backlighting sits directly behind the panel (rather than the sides of it) and is made up of several independently controlled zones of LEDs, this method tends to offer improved and more consistent contrast than edge-lit TVs. Alongside Wide Colour Gamut, HDR10, HLG and Dolby Vision support, the full array model can be used with an Amazon Echo or Echo Dot to enable voice control. Toshiba has, however, revealed that starting in 2019, ‘most’ of its OLED, 4K and Full HD Smart ranges in the UK and Germany will be updated with built-in ALexa functionality, meaning users can interact with Alexa via the TV itself using a far-field microphone, without relying on a separate Amazon speaker. Further features that will appear across Toshiba’s TV ranges include ‘Amazon Dash Replenishment’ - which will automatically reorder a new set of remote control batteries from Amazon.co.uk (or Amazon.de) when the TV detects they are low - and a customizable “scroll as you view” menu, enabling users to browse on-demand options without leaving what they are watching. Then there’s a 55in Android TV with built-in Google Assistant voice control and Chromecast. The former allows the user to search for content and control TV functions and other compatible smart home devices simply by using their own voice, while Chromecast enables the streaming (or ‘casting’) of media from a smartphone to the TV with a touch of a button. The Android TV also features a speaker designed by Onkyo. The ‘High Bright Wide Colour Gamut’ 4K HDR TV series (which comprises 49in and 55in variants) claims to display every on-screen image with 30% more brightness than other UHD TVs. And, pandering to the recent surge of lifestyle concept TVs (such as Samsung’s The Frame), Toshiba has unveiled a 2.5mm-thin ‘Wall Art’ TV designed to hang flush against a wall, as well as a 65in ‘bezel-less’ design with a 4mm frame.